Photo: Maria Valentino/ MCV Photo. A graphic sweater and studded bootie add just the right amount of playfulness to a sleek pencil skirt and adorably bookish, seafoam specs. 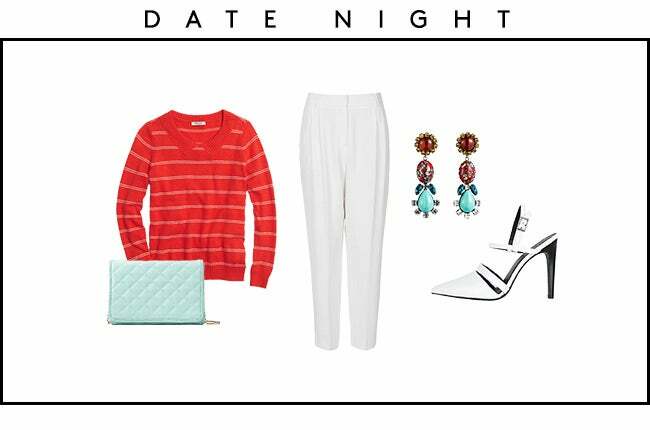 Love the whole baggy khaki, Annie Hall thing — but for date night, bright white trousers and a just-slightly oversized fit is where it’s at. Match ‘em up with slick slingbacks and your sweetest sweater for an adorably offbeat date look. Don’t be afraid to wear white on weekends! Even a sleek, bodycon-style dress feels easy to wear with a slouchy bomber and tomboy sneaks. It’s just the thing to make you stand out in a sea of denim. Bright, optic white, forever-chic black, and just a little peek of pink — not to mention the mega-dramatic proportions of that voluminous top paired with a teeny-tiny Acne jacket. That’s pretty much all you need for a majorly fashion-forward night out. Check out Trend Tracker for more genius ways to wear our favorite fall trends.